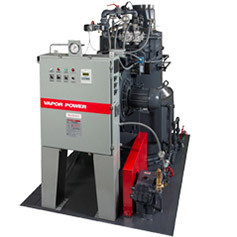 The MODULATIC steam generator is a once through, forced circulation, water tube boiler in which water under pressure circulates at high velocity through a series of coils while forced draft combustion gases travel across the outside of the coils. The hot gases envelope the entire tube surface making maximum use of both radiant and convective heat to achieve very high heat transfer rates. Water is forced by the feedwater pump into the series connected multiple coil assembly where 90% of the water is converted to steam. 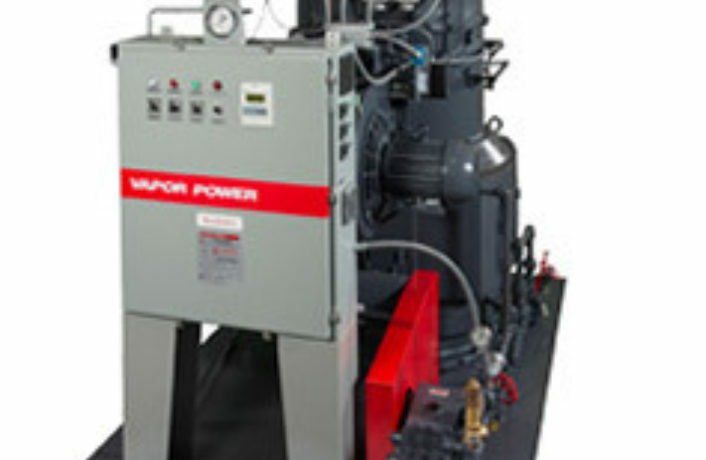 The steam and the remaining 10% unevaporated water are carried from the boiler to the separator (where unevaporated water is separated form the steam), providing 99%+ dry steam output. Solids collect at the separator bottom and are blown out when the blow down valve is opened. Close tracking of load variations is possible through use of a patented bypass regulator which continuously senses steam pressure. The control changes feedwater volume to the coils in response to every change in steam demand. This modulated flow of feedwater varies the amount of steam output without the thermal shock of on-off feedwater pump action experienced in conventional boilers.